Having sweet bread ready in about an hour generally doesn't take much prep time, but there are things to learn to make sure it turns out perfect. This guide is about tips for baking quick breads. 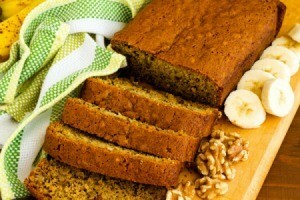 I have come up with an easy method to making the perfect quick bread loaf (banana bread, zucchini bread, etc). Before pouring your batter into the loaf pan, whether its glass or dark coated, line the inside of the pan with aluminum foil. Spray the inside then with non stick cooking spray. Just use a big enough piece of foil to completely line the inside and also make sure it hangs over the longest sides of the pan about 1/2 to 1 inch. Just crunch the foil on the sides a little so when its cooled you have a good grip (handles). Once you line the pans, pour in your batter, and bake. When the loaf has cooled off enough, just grab the sides of the over hanging foil, and lift and the whole loaf will come out of the pan. Since you use non stick cooking spray then the foil easily comes away from the loaf. I loved my idea so much because if you want a nice warm slice of bread, the slice comes out perfectly without crumbling. Spruce up your quick breads for a party or gift platter by slicing it into small "fingers" then drizzling with melted chocolate. I melted about a cup of chocolate chips with a teaspoon of shortening in the microwave. If you don't have piping tools for icing, just put the chocolate in a ziploc baggie and snip the corner off. Use different flavor chips to go with different kinds of bread. What causes some breads to bake completely and some to have a gooey middle even after extra time baking? I'm talking about breads like banana bread, breads made with a starter, etc. Don't bake them on a rainy or moist day. Bake at a lower temp. for longer until toothpick comes out clean. what temp are you baking them at? Is your oven temperature accurate? You could get an oven thermometer to monitor the temperature of your oven. Maybe it is hotter than what the temperature knob up top says. I have that problem as well when making banana bread. I have found that keeping the temperature lower...300-325 degrees helps. Using teflon also changes the way breads will cook. Just lower your temperature and cook longer. The suggestions posted so far are very good advice; the only thing I can add is, try adding wheat gluten. This the stuff in flour that bonds the dough together during rising and baking, trapping the gas produced into bubbles. For regular white breads you probably won't need this, but especially if you are using whole wheat, rye or other flour it makes a huge difference. Also, note that if you are adding stuff like bananas or cheese or fruit, that stuff has no gluten and displaces white flour, which has. Rule of thumb is the less white flour in a bread, the more you need to add gluten. I don't know why most bread recipes don't include this in the list of ingredients; I have learned to add it to every loaf I bake and the difference it makes in some recipes is pretty astounding. I wouldn't even try stuff like banana breads or my (one day to be famous) "Hot Chili Pepper & Cheese Buttermilk Bread" without it. I had this problem, too, and I can't add wheat gluten, since I can't have wheat. I will lower the temperature from 365 to 325 and bake it longer. I was using gluten-free flour. When I make a sweet bread loaf (no yeast), the outer edge and into the loaf is dark, though not burned. I use a convection oven and make several loaves at the same time. Any ideas? If you baked them in a Bain Marie this wouldn't happen. It shares the heat evenly.